Location, location, location!!! 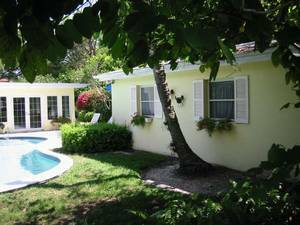 This 3 bedroom/3 bath property in a spacious, lush and private garden is nestled in heart of Olde Naples, on a quiet residential street, lined with beautiful trees and a just 5 mins walk to Naples' pristine, white, sandy beaches as well as just 6 blocks away from prestigious 5th Ave S shopping and dining. Just leave the car in the garage and enjoy Florida at it's best. This house is the owner's gem and you'll notice it's being treated as such. Wonderfully decorated rooms (see customer testimonials) await you to help relax and enjoy the tranquility of house and garden. 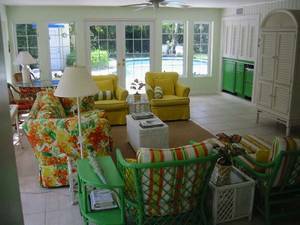 The Family/Florida room is decorated with bright, cheerful colors of yellow, oranges, etc. for the couches, floral chairs, armoire with t.v. / vcr / DVD. 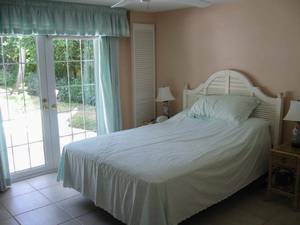 The master suite offers a king-size bed, white dresser, private bath, and French doors leading to the heated pool and truly private / fully maintained garden area. 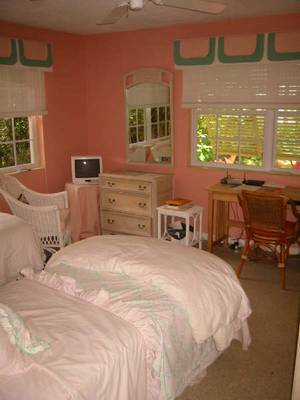 The second bedroom has two twin beds, dresser, set in light furnishings, with private bath. The third bedroom has a queen and one twin bed, dresser, set in light furniture, with private 3rd bath. 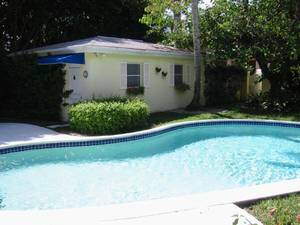 Casa Pina takes pride in being reminiscent of the true Florida beach home, yet tastefully updated in decor, style and technology of the new millennium, incl. 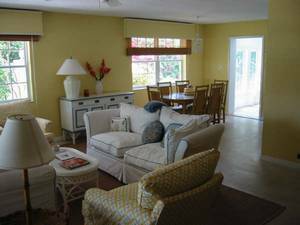 3 flat panel LCD TVs, DVD players as well as broadband Internet access / wireless network in case you'll want to be in touch while living in an oasis. 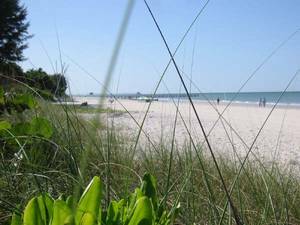 Enjoy tennis at the Cambier Park tennis facility downtown on 8th Ave. S or play a round of golf at the Naples Beach Hotel & Golf Club just 7 blocks north of the house. For more information without obligation click the contact link above. Special rates may apply based on occupancy, season and duration of stay. Just go and check. Great house with kids (note the pool is not fenced!). 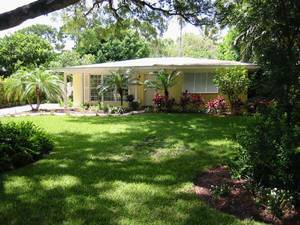 Enjoy buzzing Naples by living in your oasis right in the middle of it. Suzanne, We returned on Saturday from a glorious week in Florida. Your house was charming and very comfortable! Needless to say the children spent most of their time in the pool! We will always cherish fond memories of "the house in Old Naples." Thank you, Linda and family. Rates vary by utilization, length of stay and season.